I mean that in the nicest way – sort of like “Cheers” or “Here’s to You!” but I have nuts on my brain – specifically, candied walnuts. I spent several hours making 6 pounds of candied walnuts and that was all I could think about. Doing just a few would have been simple, but then how could I share them with my friends? The nuts wouldn’t have taken so long except that I had to make dinner at the same time. Multi-tasking? I feel like I’m ready for a juggling gig with Cirque du Soleil. I tried a new recipe for Butter Toffee Nuts with Sea Salt that I found on Oprah.com. I’m not sure what I did wrong, but it didn’t work out well. The nuts were super coated with candy and they wouldn’t brown. I had to add more water, mix them up and finish them in the oven (not in the recipe) and they were still strange-looking. The taste was okay, but appearance-wise they didn’t cut it. I decided to fall back on my numero uno, delicious, dependable recipe for candied nuts. This recipe comes from the “Fusion Foods Cookbook” by Hugh Carpenter and Teri Sandison. Even though this was published in 1994, it remains one of my favorites. The recipes are fabulous, the book is beautiful to look at and Hugh has a great sense of humor that makes him a delight to spend time with. His recipe for “Candied Walnut Salad with Goat Cheese” is a keeper. I have customized and simplified the technique for making the nuts. Preheat the oven to 350 degrees. Line a large baking tray with foil. Line 2 if you don’t have stone (as in granite) countertops. Put the first 4 ingredients into a medium large pot and bring to a boil. Add the nuts and stir until the mixture becomes dry (no liquid left on the bottom of the pan as you stir). Transfer the nuts to one of the baking sheets and spread evenly. Place in the oven and bake until they turn a light mahogany color, 12 – 15 minutes, stirring every 5 minutes. Remove from the oven and transfer to the second baking sheet to cool. If you are lucky enough to have granite counter tops, you can dump the nuts directly on to a clean counter. Spread as much as possible and separate large clumps using the edge of a rubber spatula. When the nuts are cool enough to handle, separate them using you fingers. I use walnuts or pecans. I recommend doing them separately as they “hold” the coating differently. This year I gave the hot nuts a liberal sprinkling of flaked salt before I tipped them out of the baking tray. I am such a rebel! I must apologize for not taking photos of the nut production. My juggling act didn’t include my camera, and I forgot to book a photo shoot. I did get a picture of some of the nuts packaged as gifts. I love the cello cones I found at Creative Packaging, and think the colorful tags I made add to their festive and cheerful appearance. Try this salad, and try the nuts. (It is embarrassing that a recipe that is so simple can yield such an outstanding result.) This is a variation I did recently, using romain lettuce and orange peppers. Still yummy. Thanks for reading my blog. Whenever I have more than 10 views a day, I’m delighted. There is something to be said for being easy to please. I’d like to take this opportunity to wish everyone a VERY Happy New Year! Yum! A friend gifts us every Christmas with a tin of her candied almonds. The whole family looks forward to this every year but Wayne usually hoards them. This year we all enjoyed them. 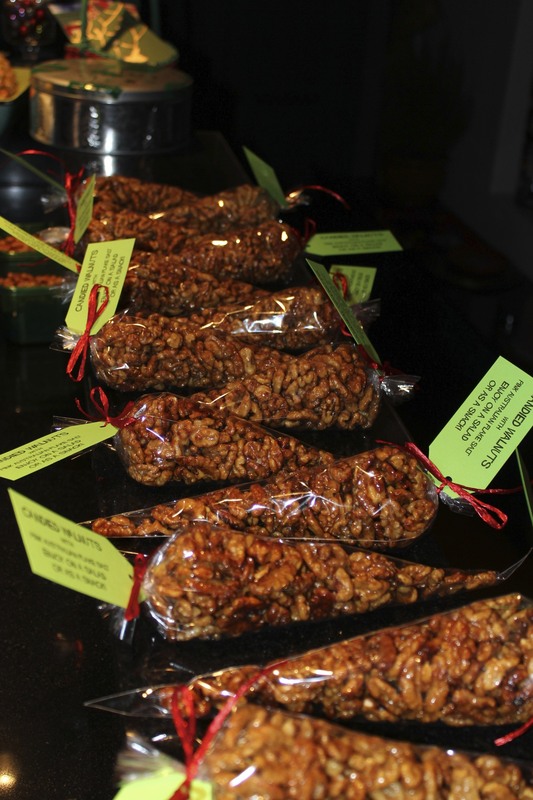 So I’m wondering if I should make your walnuts for them…and us too! I do love walnuts especially on a salad with goat’s cheese. Thanks! Great salad recipe, thank you. 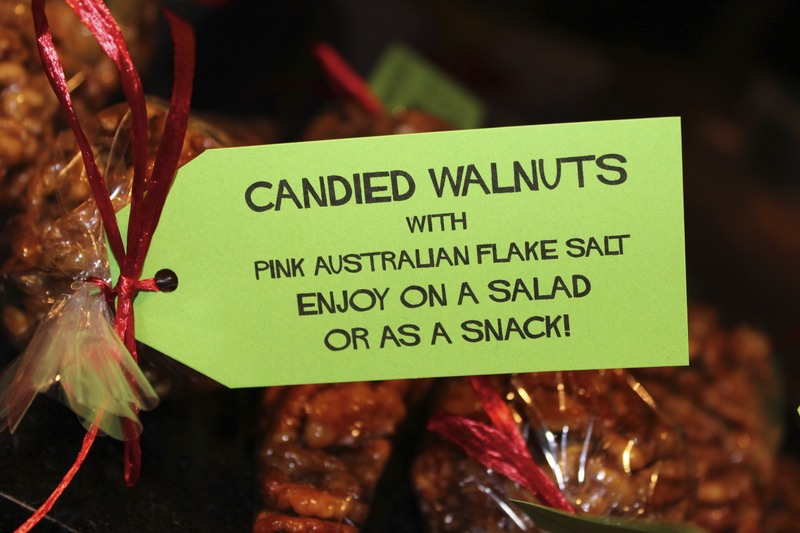 I know that those candied walnut are the best. Don’t worry, many of my good friends are nutty! I love those nuts and also really enjoy what I think is the original Martha Stewart cookbook – Cooking for Entertaining, or similar name. They are spicy nuts and I caught grief from my daughters for not having made them. Bought the nuts…never executed it! Obviously your mistake was in telling anyone that you were thinking about making the nuts. It’s better to surprise them when you’re done! you are making me hungry!! Happy New Year to you too…. Thanks so much. Hope you are having a wonderful time. See you soon! 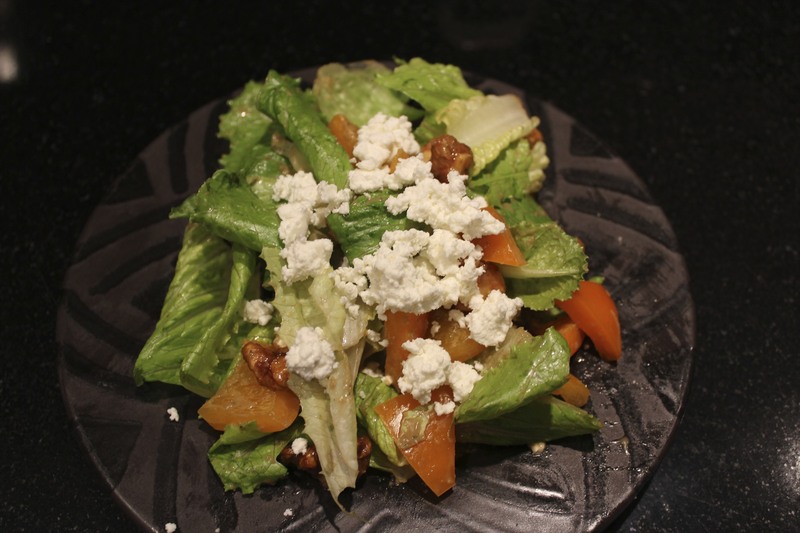 Your Candied Walnut Salad with Goat Cheese sounds delicious. This salad is always a hit. You need to try it. Thanks for reading and sending a comment. This blog is such fun – getting comments from people all over the world is delightful!